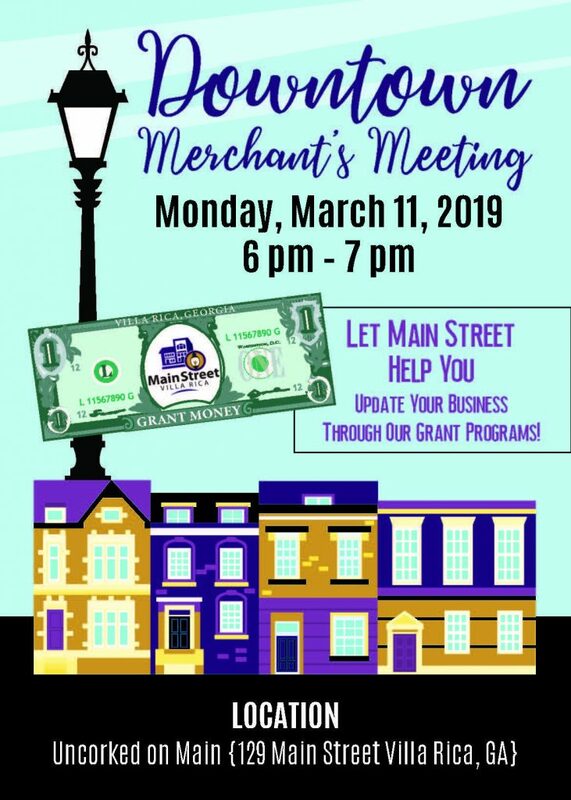 In the spirit of working together, merchant businesses from Villa Rica Main Street’s central business district invite their peers to a Merchant to Merchant Meeting on Monday, March 11, 2019. The meeting will be held at UnCorked on Main (129 Main St.) from 6 pm until 7 pm. The meeting is about merchants talking to and sharing with other merchants. As well as the Villa Rica Main Street office educating the merchants about available grant opportunities. Registration to the event is free, but we do ask that you RSVP to Sharon Dupont at sdupont@villarica.org, so we can get some idea of attendance. Businesses can send staff members beyond business ownership. We want to get information out to all the business staff that can implement changes to boost sales and traffic.